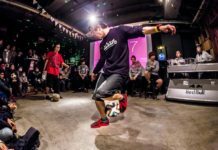 Indonesian freestyler Ardhi Andryadi recently followed up a great year with an impressive third-place finish in the Asian Freestyle Football Championship. He is currently Indonesia’s national champion for the third year in a row, and is quickly gaining the admiration and respect of the freestyle community. We caught up with the humble and hardworking athlete to get some insight into his training methodology and his list of this edition of Urban Picks. Urban Pitch: Can you tell me your background in freestyle? How did you get started? Ardhi Andryadi: Before I started freestyle I was just a futsal player in my high school team. Then I saw a video of Rondaldinho freestyling … I started to wonder and search for freestyle videos on YouTube. After that I was more interested to try and keep practicing until now. What is your training schedule like? I try to exercise every day, for 3 to 4 hours, and I practice what I want to train. For example, if I want to practice lower moves, then I will be more focused on training lowers. What motivates you to freestyle? First because I really like freestyle and freestyle practice does not become a burden to me. Instead it’s something that makes me feel better. Also, I see a challenge in freestyle that always kept me wanting to practice more and more. Also the support of my family who continues to support me doing what I love. You just got third place at the AFFC, and many freestylers have commented on how strong your performances were. What was that experience like for you? I really did not think I could get third place because there were many freestylers I thought were better than me. I feel proud and also surprised by the achievement. AFFC is an incredible experience in my freestyle journey. What are you doing now, and what are your next goals? Continue to practice freestyle and master the tricks that I have not mastered. My next goal is to be able to follow freestyle competitions as much as possible at an international level.